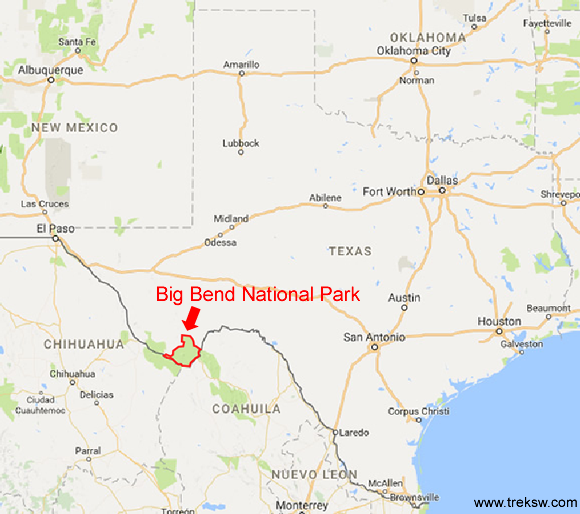 Where is Big Bend National Park? It’s way out there. Far away from what most Americans would consider civilization. Over three hours from the nearest commercial airport (in Midland, Texas). Big Bend National Park sits in one of the most remote parts of West Texas, bordering Mexico along the Rio Grande River (its called Big Bend due to sitting in the “big bend” of the Rio Grande River). There are two entrance stations to Big Bend National Park. The Persimmon Gap Entrance Station (head South from Marathon about 42 miles on Hwy 385) will get you into the park the fastest, regardless of which direction you are coming from. 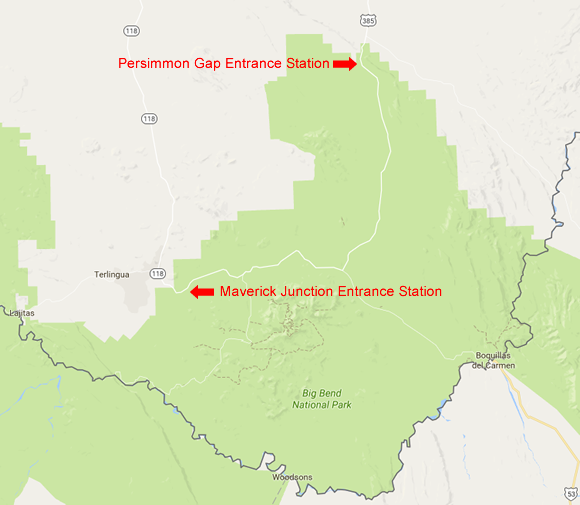 The Maverick Junction Entrance (just a few miles from Study Butte-Terlingua on Hwy 118) is probably your best bet if you’ve chosen to stay in Terlingua and want to check into your lodging before heading into the park. Remember, the highways heading toward the park have a 70 mph speed limit and the park itself has a 45 mph speed limit (which is STRICTLY enforced) and its almost fifty miles to get across the park. 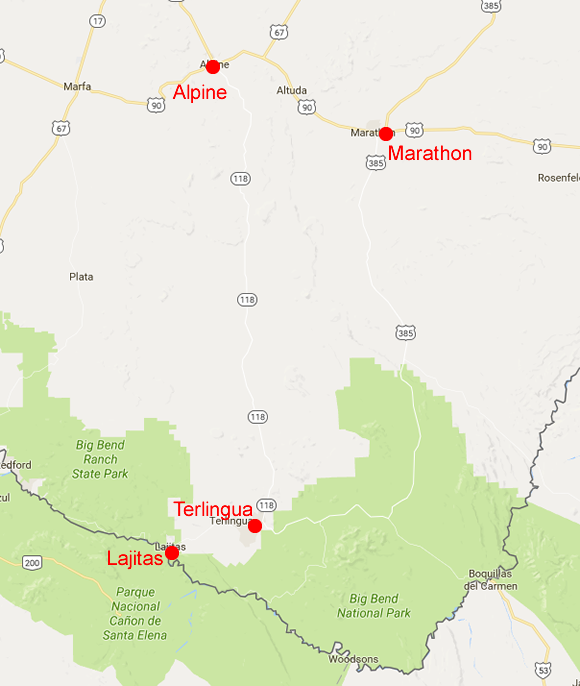 It would probably be faster to head into Terlingua through Alpine rather than crossing the park from the Persimmon Gap Entrance, although you’ll have more miles to drive. If you’re staying inside the park, the Persimmon Gap Entrance will probably be the fastest way in for you. All of the distances below are to get to the Persimmon Gap Entrance Station. The Maverick Junction Entrance Station on the West side of the park will add at least a few extra miles if you’re coming in from the West (ie., El Paso), and thirty-five to ninety extra miles if you’re coming in from the East (ie., Houston). If you’ve decided to get lodging outside of the park in one of the nearby towns, the entrance station you use will be different, depending on where you stay. Terlingua/Study Butte – Terlingua is by far the most popular destination for people going to Big Bend National Park. It offers the most in the way of night life and other events. Its also only about five miles to the Maverick Junction Entrance. Lajitas – Lajitas is just down the road from Terlingua and only about sixteen miles from the Maverick Junction entrance and is home of Lajitas Golf Resort and Spa, if you’re looking for that sort of experience while you’re in the area. Marathon – Marathon is the best option if you want to be near the Persimmon Gap Entrance during your stay. It is a bit of a drive at forty-two miles to the entrance station though. Its the home of our favorite hotel in the area, the Gage Hotel. Alpine – The most populated nearby town (about 6,000 people) is Alpine, Texas. This is a good choice if you’ve just gotta be near civilization. Its quite a drive to the Persimmon Gap Entrance Station at 72 miles though (Maverick Junction is even further at about eighty-two miles). Regardless of where you stay, there will be quite a bit of driving involved. We recommend trying to stick to daylight hours while you’re on the road. The wildlife in Big Bend can do a lot of damage at 70 miles per hour. With Big Bend National Park being out in the flat desert country, so far from civilization, you’ll be able to move pretty fast and you wont have to worry about traffic. Also, you need to make sure you top off your gas tank whenever you get the chance. It may be sixty miles before you see another. In summary, if your question is “Where is Big Bend National Park?”, it’s a long way from anywhere.